There’s a powerful message resounding from such big brands as Eileen Fisher and Patagonia, along with a growing cadre of smaller thrift and resale shops: Let’s make do, reuse, recycle. It’s back-to-school time, which means the advertisements are everywhere: Buy! Buy! Buy! Pencils and gadgets. Backpacks and sneakers. And, yes, heaps and piles of brand-new clothes. But this year, those ads are running up against another powerful message, resounding from such big brands as Eileen Fisher and Patagonia, along with a growing cadre of smaller thrift and resale shops: Let’s make do, reuse, recycle. Fast-fashion trends, driven by consumer taste and innovations in textile manufacturing, have overstuffed American closets. Clothes shopping has emerged as a weekly habit, and people are constantly clearing out and buying new. Pounds of textiles Americans will throw away in 2019, according to the Council of Textile Recycling. Estimated tons of resources the global textile industry uses per year, chiefly water and energy. It’s a big problem. In 2019, Americans will throw away more than 35 billion pounds of textiles, according to the Council for Textile Recycling. That’s nearly double the number from 1999. It’s more important than ever, environmental advocates say, to keep that clothing out of landfills. 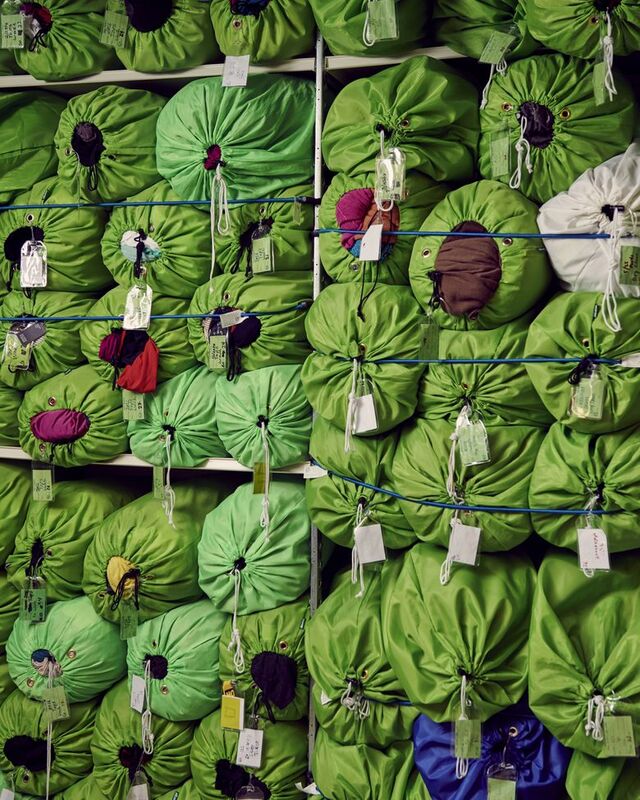 “We’re trying to take responsibility,” said Eileen Fisher, whose eponymous fashion brand buys back its garments from customers at $5 each and reworks the material into new merchandise, under its Renew brand, at factories in Irvington, New York and Seattle. It bought back its millionth garment in May. Fisher lives near the former printing warehouse in Irvington that the company converted into its Renew sewing factory. She walked through its clothing-intake center, wearing a gray and white kimono coat made from patches of Eileen Fisher clothing scraps that were turned into felt. At an early stage in her 34-year-old company, Fisher said she and her co-workers grew alarmed at the environmental toll of clothing manufacturing — from depleted farm fields to dye pollution in rivers. Her company’s reuse efforts have expanded into its Circular by Design mission, in which today’s clothes become tomorrow’s raw materials. Patagonia, the Ventura, California-based outdoor clothier, has for decades been a worldwide leader in this closed-loop system of manufacturing and reuse. It’s estimated that the global textile industry uses 98 million tons of resources a year, chiefly water and energy. Fabric dyes have polluted major rivers in India, Bangladesh, China and other countries. The plight of underpaid workers producing fast fashion in unsafe factories has sparked outrage expressed in documentaries and books. The large and ambitious buyback, repair and repurpose operations signal a fundamental shift in consumers’ relationship with clothing. One vision of the future works like this: Brands manage the products they make after consumers use them. Consumers buy garments with the idea of keeping them as long as possible, and then the brand repairs and resells them. If garments are too damaged to be donated or resold, they will be “upcycled” into new clothing or recycled into fibers. So, for instance, a favorite shirt may one day provide the fiber that insulates a home. Or the fabric of a sofa. A garment might have six or seven life cycles. Repurposing “can be made into a business that’s profitable,” Fisher said, noting that her company’s Renew operation brings in $3 million of the company’s $450 million in annual sales. At its huge service center in Reno, Nevada, Patagonia houses a repair facility where 70 full-time employees replace zippers, patch rips and renew and return items that customers may have bought decades before. The company’s Worn Wear program, begun in 2005, includes cute clapboarded rigs that make regular tours to U.S. college campuses and ski resorts and to international locations, teaching customers how to repair items. Shoppers can sell used Patagonia items in good condition back to the company and buy “certified, pre-owned” Patagonia gear at discounted prices online. 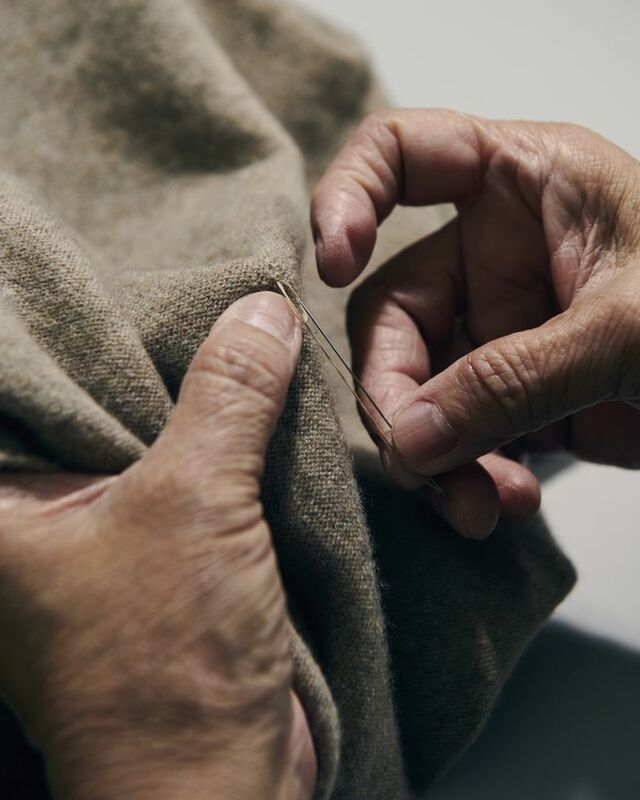 To further the cause, Cynthia Power, facilities manager for Eileen Fisher’s Renew, is kept busy showing other clothing manufacturers how its 40 employees mend, overdye, resew or felt (a way of processing fabric) buyback silk, wool, cashmere and cotton. “This is where our industry is going,” Powers said, watching as head designer Carmen Gama pinned a jumpsuit for Renew’s fall 2019 line using fabric from five pairs of used black jeans. The recycled textiles also are turned into wall hangings, pillows, coats, vests and kimono jackets. “Waste can be art,” Eileen Fisher designing artist Sigi Ahl said. The pillows are sold at ABC Home stores, and a Paris gallery sells the wall art. Both types of product were displayed in June at the American Institute of Architects’ sustainable exhibit at the Javits Center in New York. The Renew program also studies fiber wear and clothing-construction techniques to generate performance data — such as how well a particular material held up — that it puts on Excel spreadsheets, Fisher said. The information “inspires the main fashion line” to do better, she said. Todd Copeland, Patagonia’s environmental-responsibility manager, said the company, a founding member of the Sustainable Apparel Coalition, has long turned yarns made from plastic bottles into fleece, for example, and made fabric from plant fibers such as eucalyptus. He said Patagonia has relationships with at least 85 finished goods factories in 17 countries, at least 150 material suppliers in 25 countries and at least 200 farms, and the company examines them all for business capability, quality, environmental impact and social impact. It’s back-to-school time, and Kidding Around, a children’s resale shop in Clive, Iowa, has been hopping for weeks. July, August and September are the store’s busiest months, and there is brisk turnover of the 18,000 secondhand clothing items for sale. The 4,000-square-foot store, outside Des Moines, is open seven days a week. A staff of nine keeps up with the flow of garments coming in and going out. Parents drop off lightly worn clothing and never-worn garments — “new with tags” in resale parlance — and receive cash or store credit. The number of thrift, consignment and resale businesses has exploded in recent years, growing by 7 percent annually, according to trade association figures. Online, a new crop of resale shops such as ThredUp and Vinted has emerged, as well as internet-only sales platforms sponsored by traditional thrifts such as Goodwill and the Salvation Army. These time-honored nonprofits face increased competition because of the nationwide expansion of for-profit chains such as Clothes Mentor, Buffalo Exchange and Plato’s Closet. Clothing-rental companies such as Rent the Runway, another form of recycling, have also been booming. Now, one out of six Americans shops for resale clothing. But only about 15 percent of clothing in America is recycled. At a textiles summit in New York in October, Ben Rose, representing the city’s Sanitation Department, disclosed a stunning figure. Each year, on the day of the New York City Marathon, runners shed as much as 100 tons of clothing. His department places collection bins inside apartment buildings. Most of the textile waste it collects goes to salvage and is turned into such products as wiping cloths, auto insulation and carpet padding. Worldwide, less than 1 percent of the material used to produce clothes is eventually recycled, according to an Ellen MacArthur Foundation report. The waste causes major environmental damage and the annual loss of about $100 billion of potentially useful textiles that are burned or buried in landfills. Some industries are stepping up. Airlines such as Southwest, Jet Blue, Delta and KLM are recycling uniforms, blankets and cushion fabrics, which are turned into totes, luggage tags and stuffed animals. Unlike recent changes in the food industry, where restaurants and corporations responded to consumer demands for more healthful food, much of the initiative on combating textile waste is coming from forward-thinking clothing companies and industry associations. The summit in New York on innovations in textile manufacturing, waste reduction and reuse brought together a large roster of groups working on the problem, including the Product Stewardship Institute, Textile Recovery, the New York state Pollution Prevention Institute and the New York Product Stewardship Council. College students have been early adopters of the waste-reduction issue. A campus-based nonprofit, the Post-Landfill Action Network, has chapters at about 100 universities across North America. The group promotes plastic-free campuses, food recovery and composing programs, efforts to salvage items students discard when they move out at the end of the year and campus thrift stores.